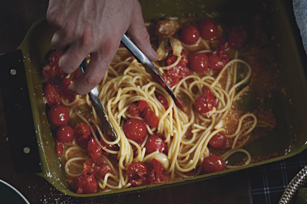 Combine cherry tomatoes, garlic and fresh rosemary to make our Farmers' Market Spaghetti Recipe. Top this spaghetti recipe with Parmesan and enjoy. Toss tomatoes with garlic, rosemary, 2 Tbsp. cheese and oil; spoon into 13x9-inch pan. Bake 15 to 20 min. or until tomatoes start to burst. Meanwhile, cook spaghetti as directed on package, omitting salt. Discard rosemary from tomato mixture. Drain spaghetti, reserving 1/4 cup cooking water. Add to tomato mixture with dressing; mix lightly. Top with pepper and remaining cheese. Garnish with 1/4 cup chopped fresh basil. Omit rosemary. Cook spaghetti as directed on package, omitting salt. Meanwhile, cook tomatoes in dressing in large covered skillet on medium-high heat 8 min. Stir in garlic; cook, covered, 2 min. Drain spaghetti, reserving 1/4 cup cooking water. Add to tomato mixture with oil; mix lightly. Season with pepper; top with cheese. Garnish with 1/4 cup chopped fresh basil.